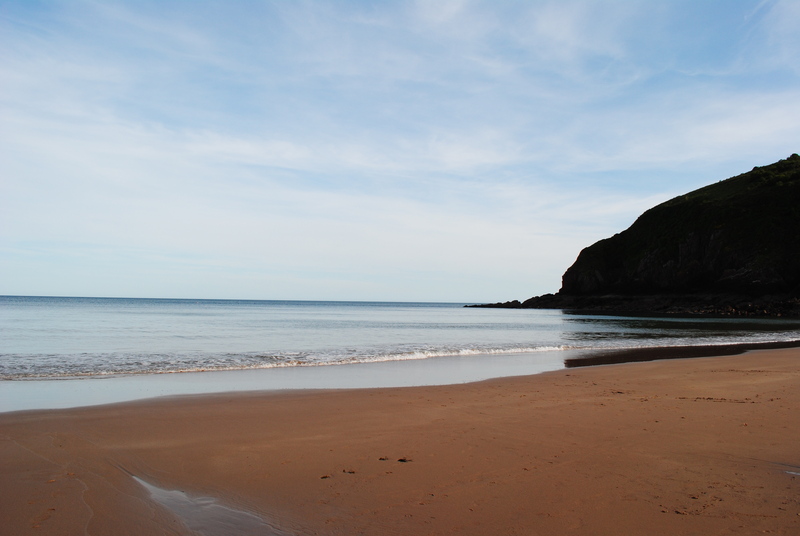 It would be criminal to go to West Wales and not visit at least one of the stunning beaches. 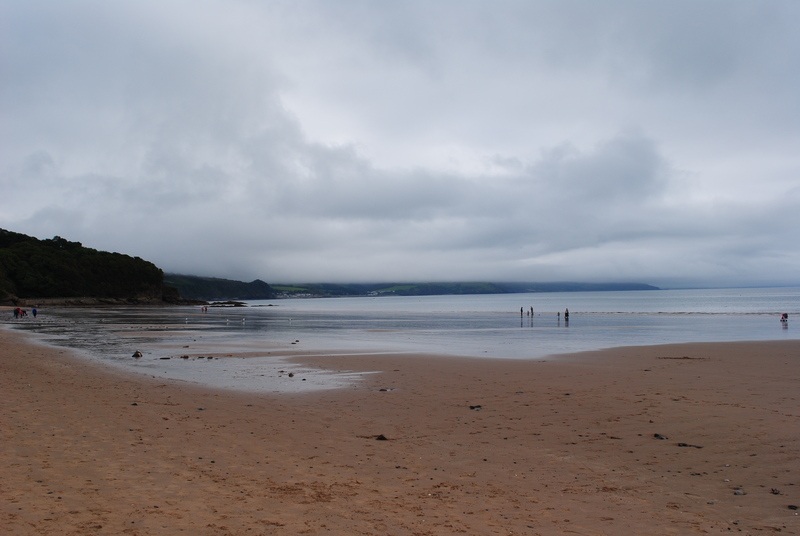 On my recent trip there with my friend and her family, we thought we’d squeeze every last drop out of the British summer that we could and head to Saundersfoot for a couple of hours. When it comes to the West Walian coastline, I think the pictures speak for themselves. A lot of places in Wales are given beautiful, poetic sounding names in Welsh that usually translate as something quite mundane in English. Others, however, are given very English sounding names. During my week in Anglesey, I’d driven around with my bodyboard in the back of my car in the hope that I would be able to find a decent surf beach. One of my hosts for the week, Ela, told me that the best place to try was Rhosneigr. I went there to find it filled with kite surfers. Although the surf looked good, I didn’t fancy risking trying to boadyboard amongst the kite lines. Different sports are usually kept to different areas on the beach, but here it seemed that anyone could go pretty much anywhere they wanted. I asked one of the kite-surfers for advice, and he told me that he’s spotted some more surfer-friendly beaches further down the coast towards Newborough. On my next free afternoon, I headed that way to find no surf, no other surfers in sight, and really long walks to reach the beaches. I was given a couple more false leads in Anglesey before I accepted the fact that I wouldn’t be bodyboarding that week. On my return to South Wales, I drove down the West coast of the country. There still wasn’t a wave in sight. 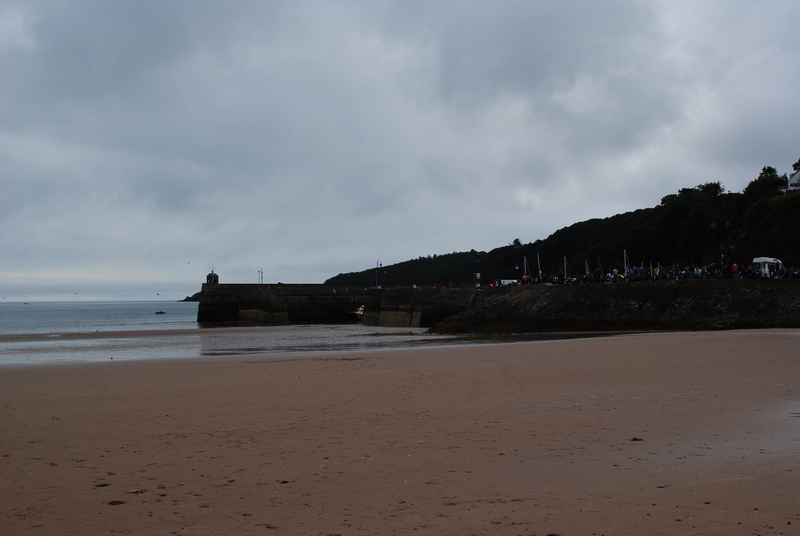 By 6pm I was close to Tenby, feeling tired, definitely hungry and more than a little fed-up. I considered driving straight back to Cardiff. I knew that if I did, though, I’d feel defeated. I didn’t have to be back in Cardiff for another 24 hours, and I felt I had more exploring to do. Having given up on my search for surf for that day, I ambled along the coast for a bit and came upon Skrinle Bay. The approach to the area doesn’t do much for it’s sales pitch, and the campsite there is very basic ( and right next to an Airforce base, which may put a lot of people off). Just a short (although very steep) walk down the cliff, though, and it’s like you’ve entered a fantasy land the likes of which are only described in childrens books. 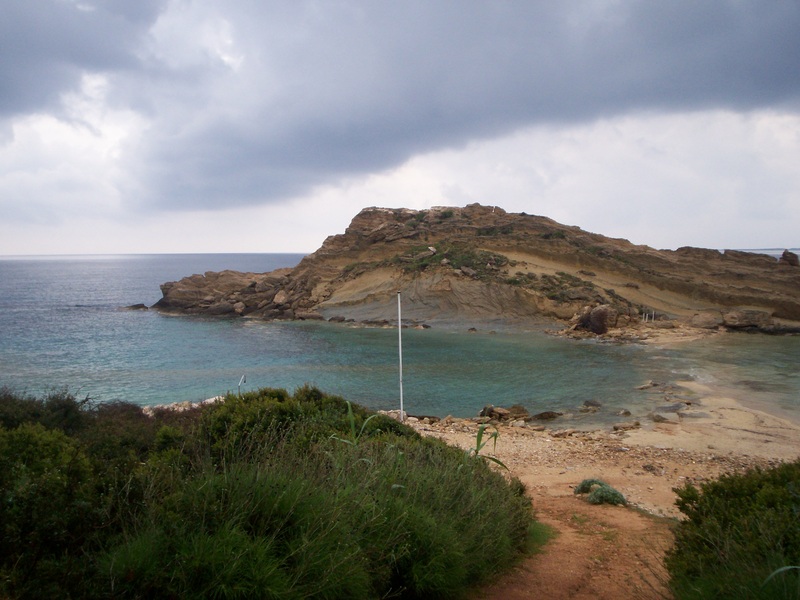 The path from the campsite takes you to Churchdoors, a small bay with a beautiful sandy beach. There’s a sign as you approach the steps to the beach that tells you not to attempt to access Skrinkle Bay from here, as you may get stranded. 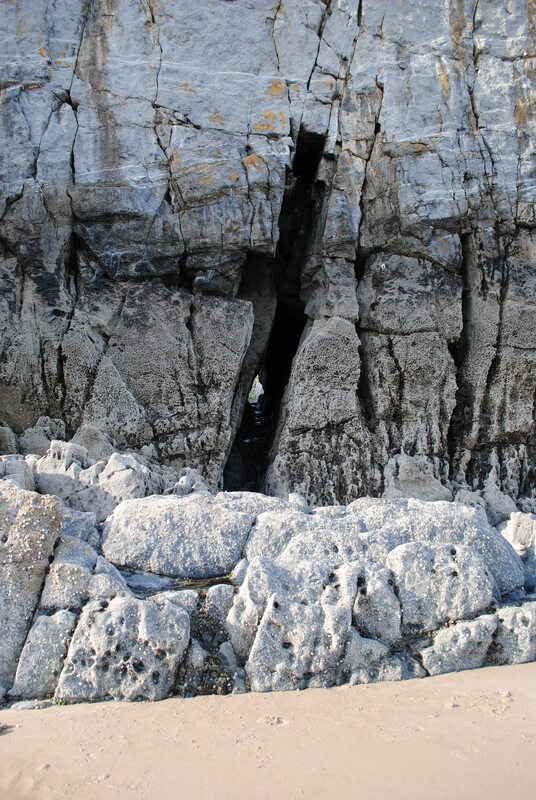 I had insider knowledge from the lady at the campsite, though, and she told me that when the tide is half-way in you can get to Skrinkle through a passageway in the rocks. 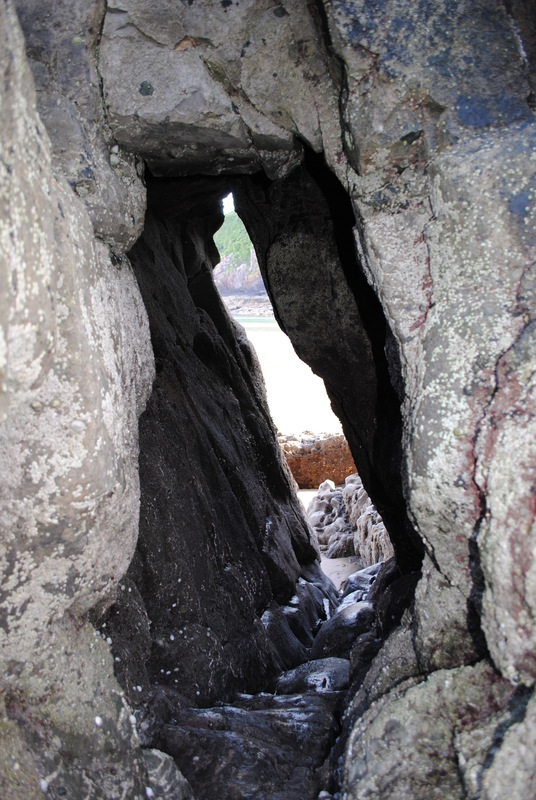 You do have to keep one eye on the sea, though, as the tide does come in very fast in South Wales and there is a real danger that you could get stranded, or worse, trapped in the passageway between the two beaches. Looking down the steps to Churchdoors. You can see the rock formation that the bay got it’s name from on the left. 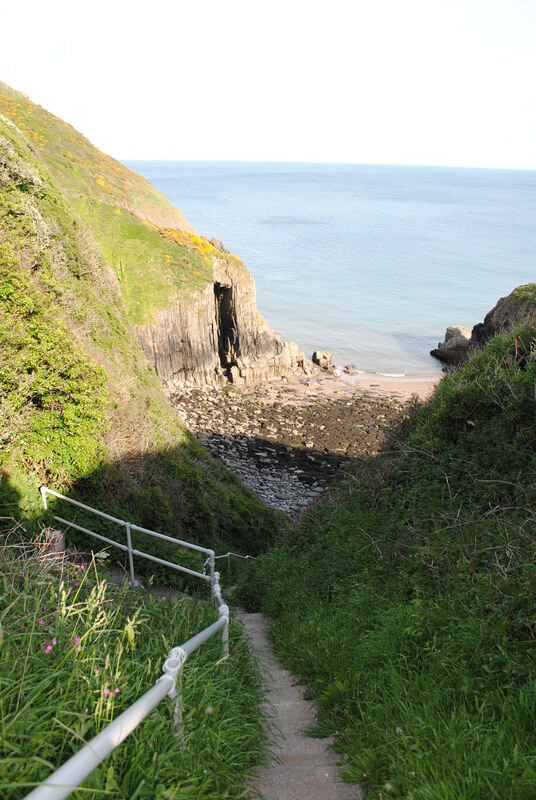 The ‘secret’ passageway through to Skrinkle Bay. In a couple of hours, this would be under water. Skirnkle Bay was definitely worth the effort. 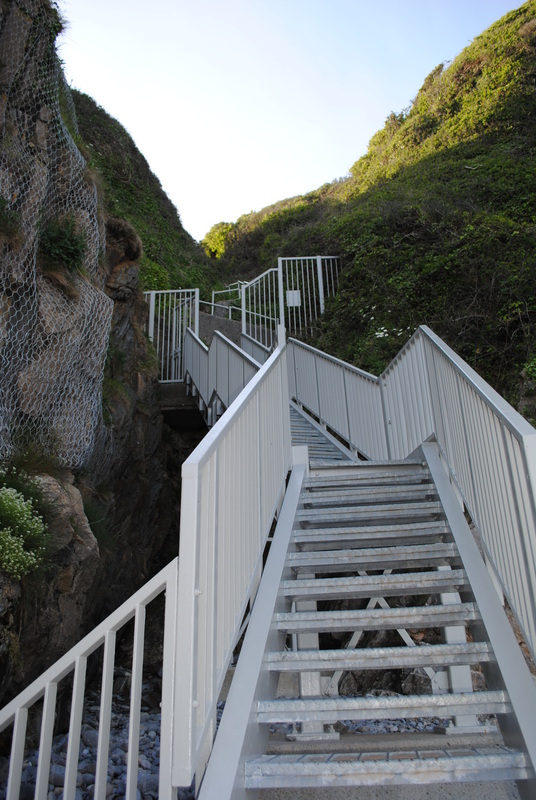 …before tackling the stairs back up to the campsite! Ailsa’s travel theme this week is Beaches. Click here to see the other entries. 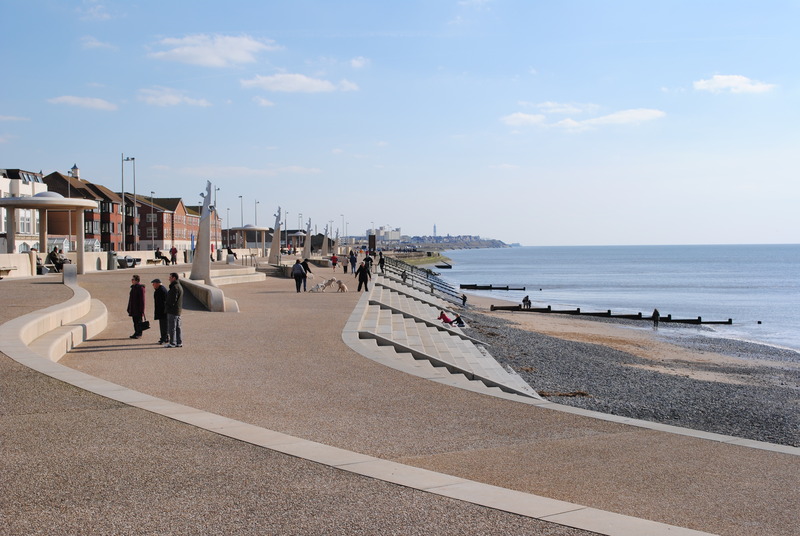 I couldn’t write a post about beaches without including a photo of the local beach where I grew up in Thornton-Cleveleys, Lancashire. 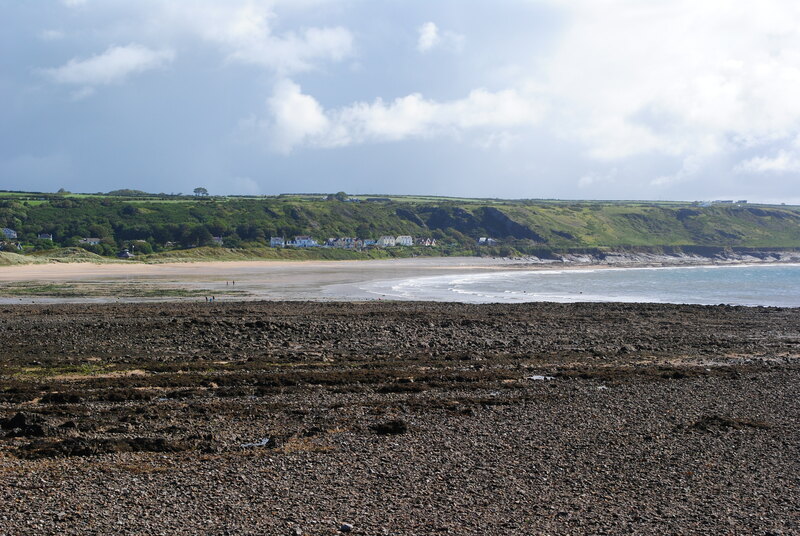 Port Eynon on the incredibly beautiful Gower in South Wales. I took this photo on Kefalonia. 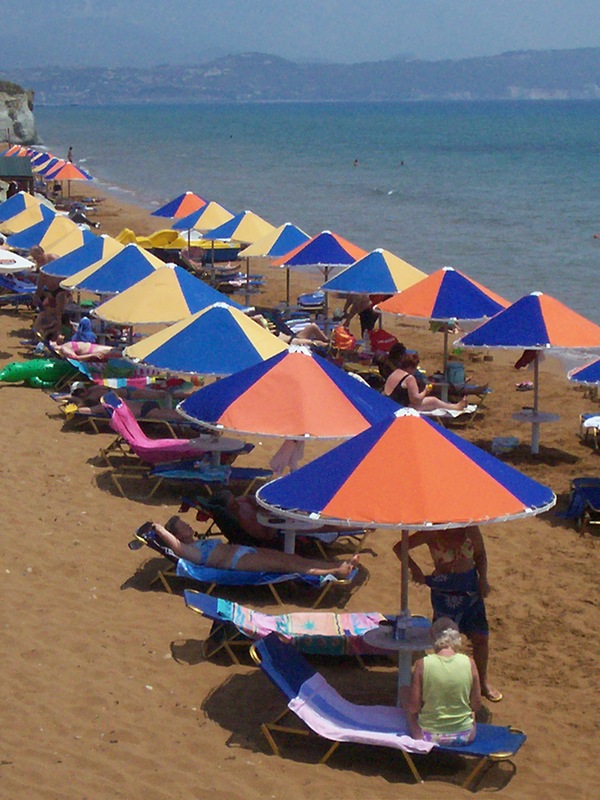 It wasn’t the best beach on the island, but I loved the colours of the parasols against the red sand. 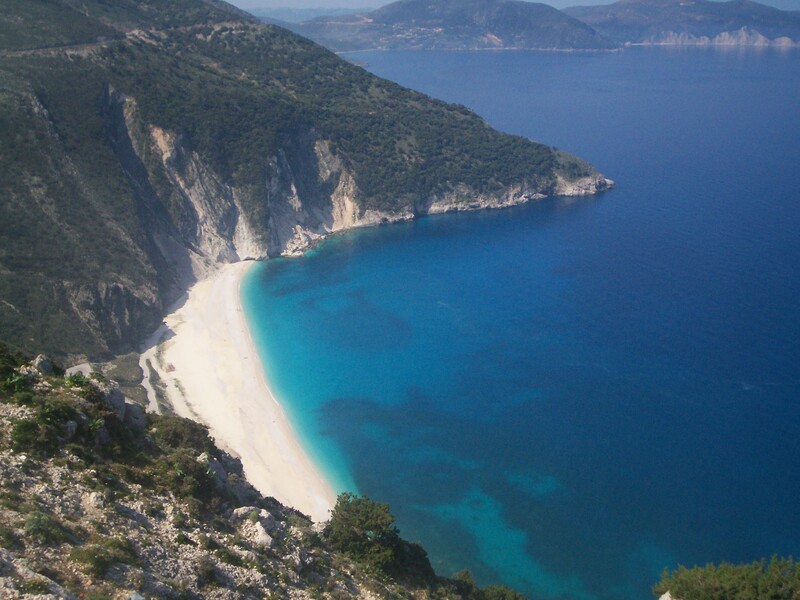 The famous Myrtos Beach, subject of many a Greek postcard. The dramatic White Rocks, also in Kefalonia. Sadly, the waves were washing the sand away right before our eyes. Unless they’ve imported some more since I took this photo about six years ago, this beach has probably disappeared by now. 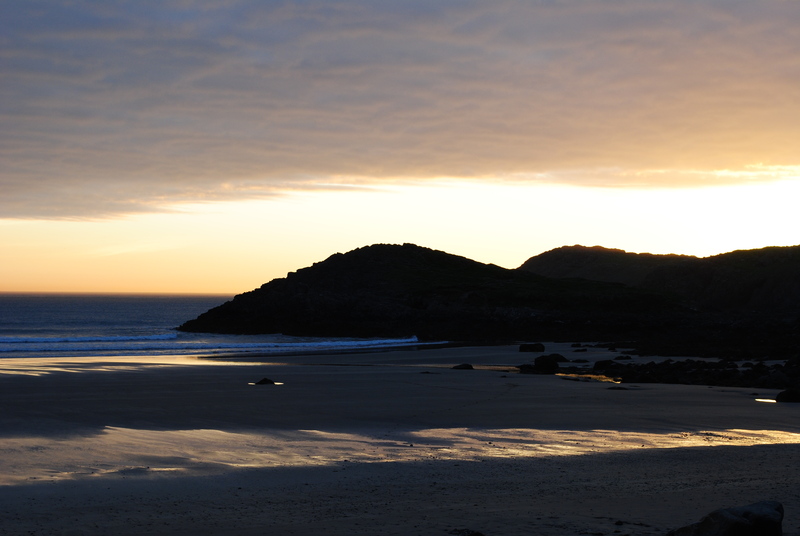 And finally, sunset over Whitesands in West Wales.